Pictured here is a buddy who happens to be a master beekeeper. 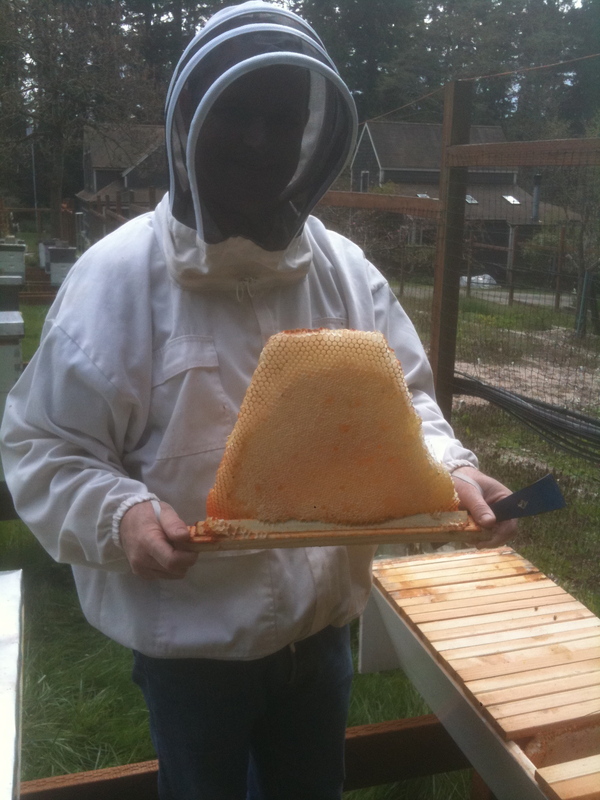 While most of the hives around here, including ours, our Langstroth style, he also keeps a few interesting Top Bar style hives, which you can see to his left. My friend generously took two beautiful honeycombs from an unused Kenyan style hive and dumped them into a five gallon bucket to send home to my family. It’s probably 6 months worth of honey! He also gave our Langstroth hives a kick start from his own Langstroths by providing 10 full frames of comb + honey to slot into our new hives. Clearly generosity is a characteristic of master beekeepers.